With the recent tragedy in Toronto among one of the many difficult experiences we have been influenced by this year, I would like to offer a reflection in our everyday life. Lifeworld, a concept developed by Edmund Husserl during WW2 in Germany, brings us the understanding that we experience life through our own perception within the perceptions around us. Edmund understood that even in the immense tragedy he and others both witnessed and experienced, life is still worth living and a sense of vitality can still be found. Although our external world may attempt to influence a way of life through pressure, our internal world attempts to strengthen our personal perception. What are these internal and external influences in everyday life and why should we care? First there is perception which can be found in many ways and yet all paths lead to enhanced awareness. When we get that feeling that our senses are telling us something, we meet our perception. Each and every day we look through the lens of our perception. We live our lives through our own eyes. Whichever way you find your perception, is it our internal ability in everyday life. Words to describe perception include; awareness, insight, realization, thought and belief. We receive or collect different information that we accept or decline internally, these influences effect our view of everyday life through a perceptual stream. Our perception is our strongest ally, it is intuition we have developed throughout our life to support us in thinking and acting in everyday life. We lead with perception. Perception is closely related to wisdom, our ability to think and act based on life experience. What’s the difference? Our perception can be pressured regardless of the wisdom we have built. Although we know how to think and act, our perception is challenged. Perception emphasizes our ways of knowing which derive from our personal experiences and from these built perceptions we project outwards. Perceptions can be judgements, they can be hateful and they can project pressure. What is pressure? Pressure is another form of influence. We can pressure ourselves or we can be pressured, these pressures often stem from a perspective. Other words for pressure include; stress, strain, coercion, force and persuade. Changes in perception do not bode well under pressure; we may not stress, strain, coerce, force or persuade another’s awareness, insight, realizations, thoughts and beliefs. This may be a good time to remember; treat others how you want to be treated. 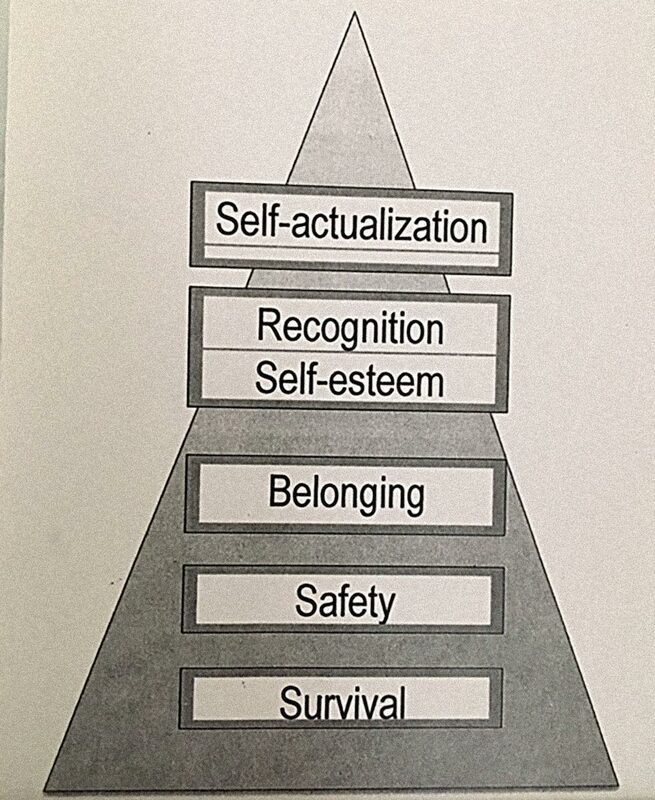 Consider Maslow’s Hierarchy of Needs, based on his theory of human motivation. When we perceive ourselves to be safe and secure, we look for belonging. This is a difficult transition in needs between security and self-esteem which often relies on our external world for support. Say for instance we have had a difficult upbringing that may not have provided the sense of belonging a loving family we believe would provide. Say we instead created new relationships with the perception we have developed overtime; with the insight that we are a worthy friend, with the realization that friendships bring us vitality, with the thought that having a supportive circle of friends will motivate me, with the belief that those I choose to befriend will also choose to befriend me, that I desire to belong. An external pressure causes a reaction in our internal perception. I am late for the third time in a row and I must decide if I will internalize the following perceptions: I am wrong for having been late therefore I feel bad. Or, I feel bad for having someone perceive I am wrong for being late. What is at stake? My participation in a group and place that I feel I belong, my belonging is at stake. How did I feel before this external influence? I felt that I had tried my best but these stomach aches sometimes put me behind and that I am taking steps to minimize this pain. How did I perceive myself before this external influence? That I am sorry for myself and others that I am often late because of my painful stomach aches but I am able to participate and want to join in. Here we can consider a multitude of ideas associated with this experience; if there are any rules on being late, what the other participants feel about lateness, if there was anything else I could have done to not be late and my relationship with lateness itself. This is pressure over perception. This is the battle between I feel and I am. When we feel our perception is one that provides us with an authentic self image, we motivate the harmony between who we are and who we want to be. External pressure, influences that aim to alter our internal perceptions, tries instead to create a haze between who we are and who we want to be through our emotional self, our feelings. We can feel this pressure over perception. This is the blessing of Lifeworld-led approach; we all live in our own world within the world around us. We all live from our own perspective within the perspectives around us. Our perspective is an accumulation of our everyday life experiences which has led to our way of knowing and being. Pressure from others who have a different perspective is just that, another’s perspective. What we choose to do with this pressure is up to us. Based on the way in which our life’s journey has unfolded, can we understand this different perception and do we wish to immerse this perspective into our own? Will this motivate the harmony between my perception of who I am and who I want to be? Or is this another situation in which their perception is trying to disharmonize who I am and who I want to be? Is their perspective pressuring me to feel differently and see myself differently? Should it? Do I? Recognizing the difference between perception and pressure brings a new ability. Our internal ability to know that the way in which we see the world and live our life is different than the way in which others see the world and live their lives. When we find connections that enable our sense of belonging it is beautiful, it means we share our worlds. When we sense there may be pressure from others, our perception will notify our emotions. When something doesn’t feel right, take the time to consider if this is how I feel or if this is who I am. When we recognize our perception as true to who we are and who we want to be, look to see if another’s perception is project pressure onto how you are feeling. From here we rely on our ability to think and act from our life’s experience, our wisdom. “It’s my life, my choice and I have something to share. I am sorry for being late a third time. I feel that you may have difficulty with the tardiness of others. To clarify, it is not from desire that I am late, it is because of my stomach pains which required my attention beyond my scheduled departure. Perhaps we can ask for the book club’s opinion but from my perspective, it is difficult for me to understand that a group in which I belong would care more about my arrival time than my pain.” There are other, more simple, ways to defend your perception from pressure as well…whatever your platform be it art, speech, writing, music or a simple gesture, it’s your life and your choice. I choose to not be pressured into living in fear. I recognize the calamity we are living in and instead strengthen my journey in providing the opportunities for a sense of vitality in all lives, through TEM.